Well, it’s been a long, cold, wet winter for everyone, and Cherrie is happy to be on her spring break. No worries about bears gone wild on this blog though, as we are having a g-rated spring break at the Miramonte Resort and Spa in Indian Wells, CA. This family-friendly resort is equally suited for kids or couples, as the youngsters can whoop it up at the main pool, yet there is also a secluded adults-only pool for those that want a kid-free environment. Access is good at the resort too, with plenty of room to roll-around on the paved paths, a nice accessible room complete with a roll-in shower and good access to the pool (complete with a pool lift) and spa. Actually the pool lift was one of Cherrie’s favorite amenities, as it allowed her enjoy one of her favorite activities – swimming. And if you’d like to get out and see the area, the resort is also close to the Palm Springs Aerial Tramway, which also offers roll-on access. 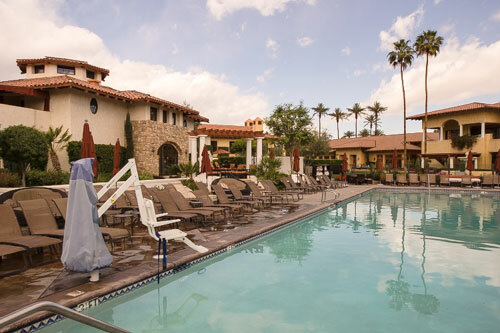 So you can do as little or as much as you like while staying at the Miramonte Resort and Spa, Indeed it’s a great accessible choice for a spring break getaway! This entry was posted in Destinations, Lodging, Traveling Cherrie and tagged accessible travel, disabled, Miramonte Resort, Palm springs, pool lift, resort, slow walkers, tramway, wheelchair, wheelchair-users by Candy B. Harrington. Bookmark the permalink.